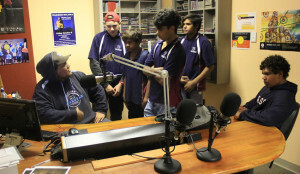 A group of students from YES Aboriginal Studies are learning about radio broadcasting through visits to Umeewarra Media and talking with broadcaster Dre Ngatokorua. Dre, 21, is a former PASS student, attending the school in 2011 and 2012. He is presently a broadcaster at Umeewarra Media and hosts the Straight Out Show. He visited PASS and spoke to the YES Aboriginal Studies class about ‘Culture and Identity’ on October 30. Dre is of is of Wangkangurru, Adnyamathnha, Kuyani, Luridja, Deiri, Yankunytjatjara, Cook Island and Maori descent. 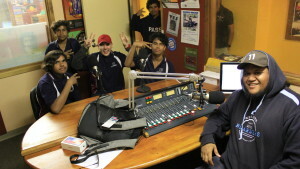 Future visits to Umeewarra Media have been planned to observe operations, to learn the skills of interviewing and to observe and be involved in radio broadcasting. Students will have the opportunity to create their own ‘Digital Story’ that can be shared online. Dre said he believes it is important for young indigenous people to have a voice and has welcomed the opportunity to mentor the students. “I think it’s important to give back,” Dre said. Dre said after completing school, he attended the Australian Film Television and Radio School, and also studied at Cert IV in Leadership and a Cert III in Business, before being employed as a broadcaster at Umeewarra.